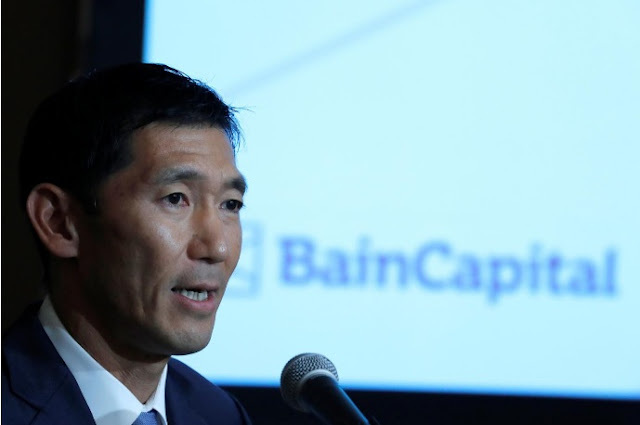 Bain Capital LP Managing Director Yuji Sugimoto speaks during a news conference in Tokyo, Japan October 5, 2017. TOKYO - U.S. private equity firm Bain Capital LP said on Thursday that it aims to list Toshiba Corp’s chip unit on the Tokyo Stock Exchange within a few years. Bain, which led a consortium that signed an $18 billion deal for Toshiba’s prized chip unit last week, also said it hopes to settle legal disputes with Western Digital Corp, Toshiba’s joint venture partner, at an early stage. U.S. private equity firm Bain Capital LP said on Thursday that it aims to list Toshiba Corp’s chip unit on the Tokyo Stock Exchange within a few years.